Vadodara: A police outpost near Sardar Estate caught fire on Tuesday night due to unknown reasons. The fire department officials said that they got a call from a police control room van patrolling in the area at 11.30 pm on Tuesday that Sardar Patel Estate police outpost is on fire. The fire department sent a fire engine from Panigate fire station to bring the fire under control. The police outpost was locked when the incident occurred due to which nobody was injured. Computers, furniture and stationery were gutted in fire. The fire department have taken help of forensic experts since the real reason behind the fire is not known. 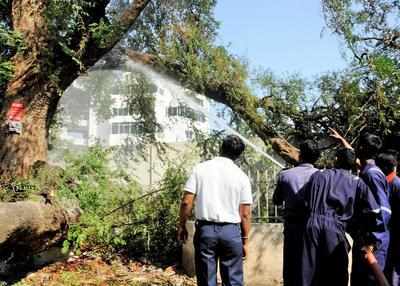 A fire also broke out in an old tamarind tree in the Baroda Medical College campus. Officials said that the trunk of the tree was hollow. The tree was in a precarious condition and started bending after the fire. It had to be brought down to prevent an accident. The reason for the fire is not known.